#6-05 Fancy antique ball rack by the Brunswick & Balke Company. Crown section with decorative carvings. Nine-shelf model with black numbers. A nice accent for many types of antique Brunswick pool tables. 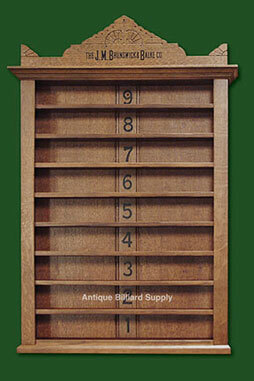 Can be used to display old billiard balls or other memorabilia. Solid oak construction with walnut finish.